There are many different types of plant life in the Temperate Deciduous Forest ranging from big trees to small flowers. Most of the trees are either a type of maple or oak. A leaf on a tree associated with the deciduous forest is know as a broadleaf. The two most common maples in this biome are the silver maple and red maple. Acer Saccharinum also know as silver maple lives near the edges of ponds and lakes. The red maple looks similar to the silver maple, but the leaves are different and red maple lives in the northeast part of the U.S. ("Biomes of..." par. 2). Two types of oaks that are common to this regions are the pin oak and the white oak. The pin oak has leaves 3" to 4" large and lives in the northern part of the U.S. and the southern part of Canada ("Biomes of..." par. 2). White oak scientific name is Quercus Alba, and is found through out the Temperate Deciduous Forest ("Biomes of..." par. 2). 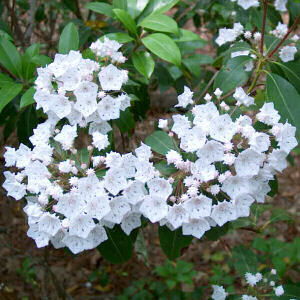 Mountain Laurel is much smaller then trees and live on the shady forest floor because it does not need a lot of sunlight ("Temperate..." par. 9).